The Evangelical Lutheran Church of America (ELCA) has added our project to their Global Gifts Program. So by following the instructions at the end of this blog entry, you can now contribute directly to the construction of spring boxes to provide potable water to villagers in the Central African Republic (CAR). Spring boxes (such as the one in the photo above) are one of the most cost-effective ways to increase access to potable water. Each spring box costs approximately $2,000 to construct and may serve a village of up to 2,000 people. Once built, spring boxes require very little or no maintenance and usually last for decades. Now, instead of muddy, parasite, and bacteria-infested water, villagers can collect clean spring water, piped directly from the source, and protected by a cement wall and basin, making it easy to collect the water in a sanitary way. Once the spring box is in place, PASE also trains people in proper hygiene, such as hand-washing, to avoid water-borne diseases. With current funding levels, PASE is able to construct 10 spring boxes a year, but with more funds for construction tools and materials, PASE could double the number of spring boxes constructed annually without hiring any extra personnel. Please follow the instructions below and contribute to providing clean water in the CAR. 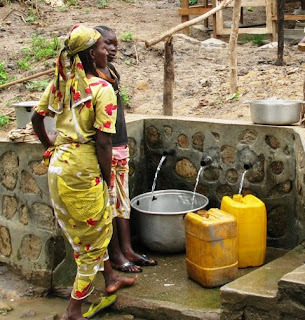 Photo: Women collecting water from a recently constructed spring box at the Emmanuel Clinic in Gallo, CAR. 1. Write a check to "The Evangelical Lutheran Church in America"
2. On the memo portion of the check, write "Water Management Project-CAR Global Gift." C. The name of the project, "Water Management Project-CAR Global Gift"